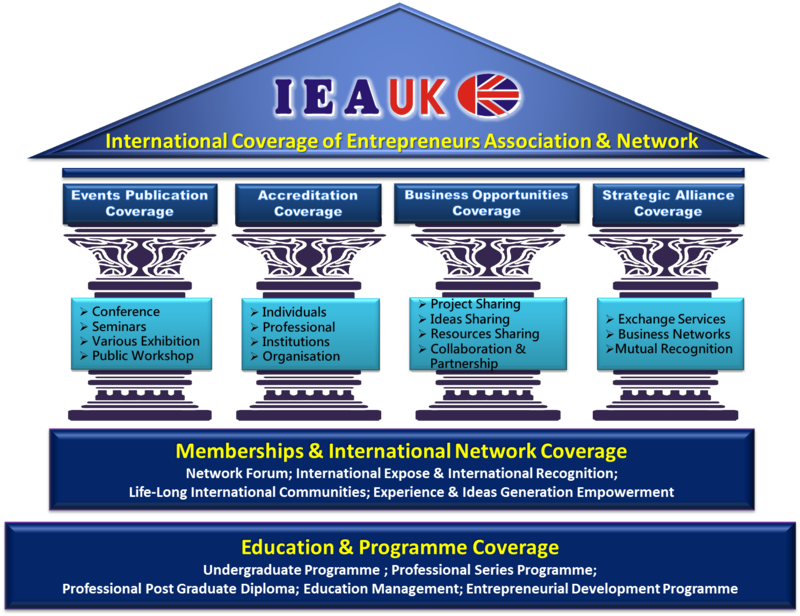 International Entrepreneurs Association (IEA) constantly welcomes all interested organizations, training or education institutions, and individual professionals to work with IEA as an Affiliated Institutions, Business Partners or Representatives in offering, adopt or to promote any of IEA’s wide range of professionally developed programmes as well as membership services to adults, professional, entrepreneurs or students. IEA believed that with passion and commitment, all potential providers can be an integral part in the progressive escalation of a group of effective Leaders in the future. We support and promote professionalism in the manner that in which the entrepreneurs conduct themselves when dealing with people, as clients and customers and organisations as partners and alliance members. Our main purpose will provide a platform for the entrepreneur to network with like-minded individuals and learn how to be successful in initiating, organizing and managing new business ventures for profit while minimizing the risk of loss. The well-developed professional training and educational programmes provide what is essentially necessary for business owners and entrepreneurs who wish to obtain qualifications through IEA’s comprehensive examination and qualifying scheme. The practical learning plus the newly acquired qualifications boost confidence and skills of entrepreneurs in achieving success in their business endeavours. Likewise, the knowledge acquired through our programme will provide the individual with the skill and confidence to operate their own business successfully. To achieve the mission of IEA, it has organised its operations into several major pillars as indicated below. All these activities are individually managed where every pillar has its own agenda, programmes, activities and budget, but structurally they are closely connected. This provides a smooth integration between different departments as this is essential to ensure that cohesive team work and united programme are implemented that leads to the unified objectives established by IEA. The IEA has two main range of services based on a combination of experience and qualifications – which demonstrate commitment and credibility in the profession. International Entrepreneurs Association (IEA) not only provides services in education & training sectors. IEA will also contribute in other services that will help to develop successful entrepreneurs internationally. IEA strives to build international prominence through its integration of teaching, research, and service to society to gain international recognition globally. IEA has special, straightforward and open approach. IEA works with entrepreneurs in a collaborative style, playing a valuable supportive role. IEA services are tailored to give maximum benefit and provide cost effective and customer-focused solutions. We offer the benefit of highly specialized expertise and extensive practical experience, from the initial concept of need and development of strategy, through implementation of programmes, to meeting our clients' objectives. IEA is committed to provide excellent support & services to ensure success of our affiliates or partners. Although our association services cover the following areas but we will never narrow it with any marvellous ideological boundaries to be part of its global vision. Strategic Alliance Clubs, Company, Organisation, Society, Association, Colleges, University and etc. Partnership Opportunity Individual, Group or Company.